SelfCAD is a full-featured online 3D modeling and slicing application that enables you to sculpt, model, and print using a single system. Since all the features are offered in one place, you don’t have to open multiple platforms and move from one app to another to design, build, and print objects. As the product is cloud based, you don’t need to download any software. 3D designing and printing was considered a difficult task even by CAD experts. Now, SelfCAD makes everything easy and enables even novices to excel in this work. The vendor offers video tutorials and a training course to enable beginners to easily master the art of 3D design in no time. 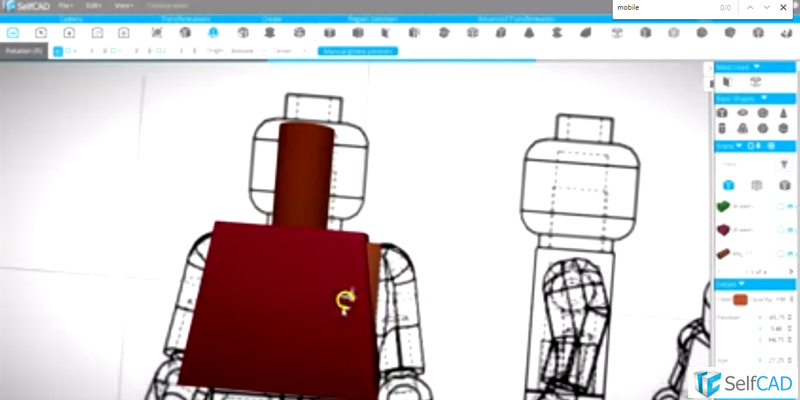 SelfCAD is a complete online CAD solution that doesn’t need extensive CAD skills. It enables even beginners to make full use of their creative talent. They can master 3D designing easily with this user-friendly platform. SelfCAD simplifies the world of 3D designing and modeling by offering all features and tools under a single roof. It provides almost limitless drawing capabilities that enable you to save time, create accurately, and move images easily. The interface is simple to work with and you can explore and give full freedom to your imagination and designing abilities. With SelfCAD, you can work with all types of design including basic 3D designs, innovative concepts, and peculiar and unique shapes. A simple mouse click enables you to finalize stunning shapes. The tool’s innovative drawing functions allow you to effortlessly work with polygons and other designs. Its macros automate and facilitate the designing stage. In short, you can easily conceive your designs and convert them into reality with this top notch CAD software. The best part is you only need an internet connection to launch and use the software from anywhere, anytime.